During the turbulent 1960s, Chicanas who funneled blood, sweat, and tears into Mexican American protest movements such as La Raza were often relegated to supporting the men who leapt to the ramparts. Stung by such sexual discrimination and disheartened by–or disinterested in–the largely middle-class Anglo agenda championed by the women’s liberation movement, Chicana feminists fought to carve out a niche. Though dry at times, the outspoken essays and writings collected in Chicana Feminist Thought record this struggle as it occurred. Not surprisingly, the writers’ voices overlap but don’t necessarily blend: one rationalizes machismo and seeks only to redirect it, while another impatiently calls for its end. 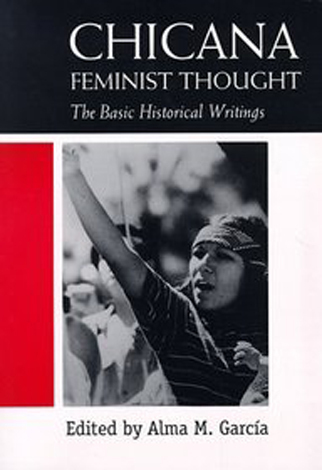 These writings, from the 1960s to the 1990s, chronicle the development and dissension of Chicana feminists faced with the high-wire balancing act of saving a culture while serving their own needs. The result is an enlightening, thought-provoking piece of feminist history. Garcia, Alma, Mario Garcia (eds.). Chicana Feminist Thought: The Basic Historical Writings. Routledge, 1997.